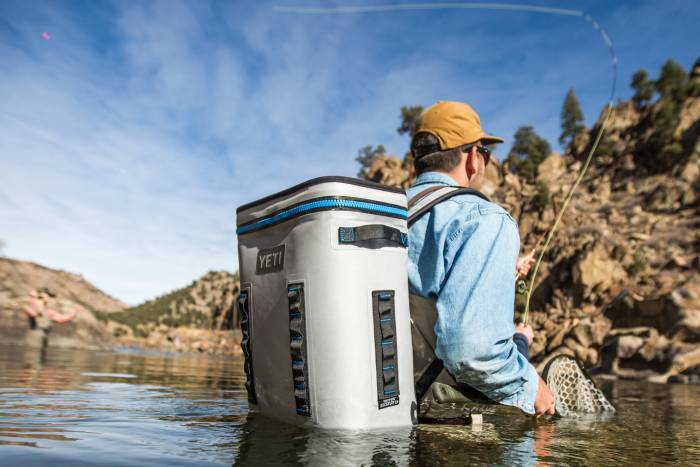 What, where, and even why to carry: YETI explains the ins and outs of its increasingly popular cooler backpack. 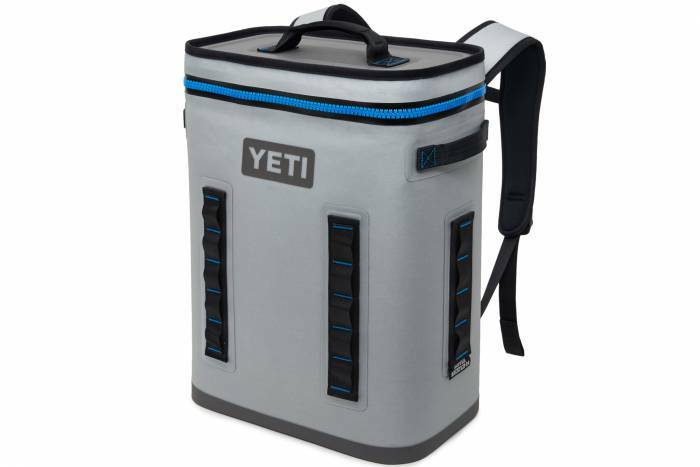 YETI made big, hard, heavy coolers very popular. But the Austin-based brand wasn’t stuck on a “bigger is better” mantra. 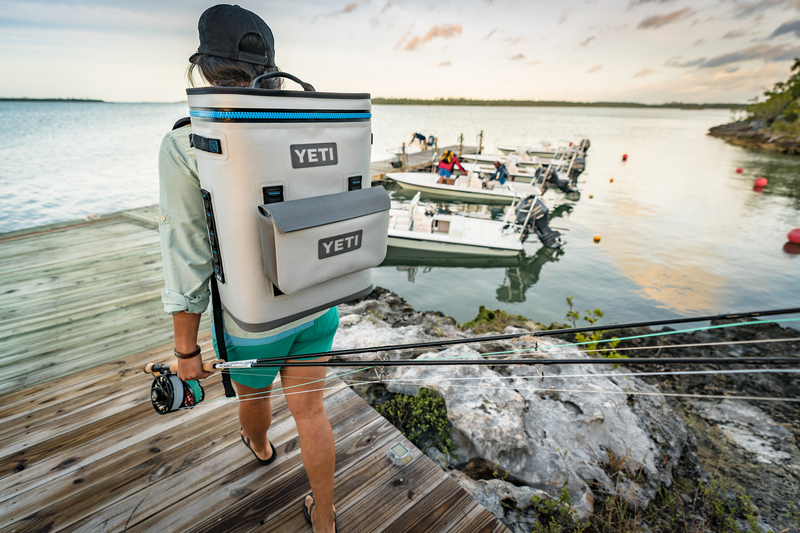 Following the success of the rotomolded Tundra, YETI launched the tailgate-friendly Roadie, followed by the soft-sided Hopper, Hopper Two, and the hybrid Hopper Flip. But this year the brand added a whole different look to its insulating products. Meet the BackFlip. Complete with shoulder straps and a hip belt, the backpack-style BackFlip marks the first YETI cooler that doesn’t demand at least one set of hands to transport. But there’s more to the BackFlip than new straps, including accessory mounts and a retooled shape. We got the scoop on everything you need to know about this new-look YETI. GearJunkie: Why would someone opt for a cooler backpack instead of a regular-carry cooler? 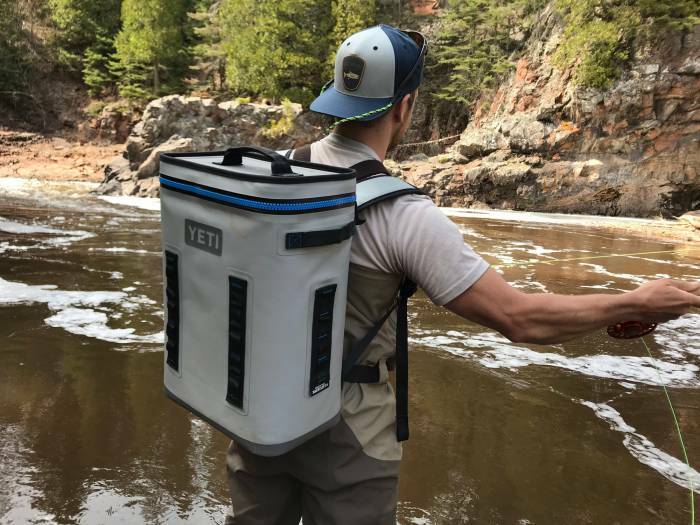 Alex Baires, YETI category manager: The Hopper BackFlip is ideal for someone looking for a convenient carry while on the go. Say you’re carrying a large load to base camp, or you’re headed to your favorite surf spot for the day. 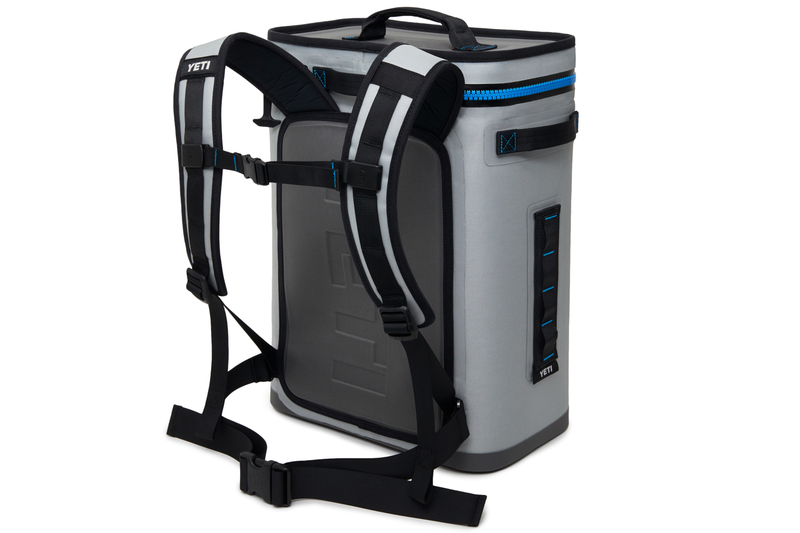 The BackFlip lets you throw your cooler on your back, leaving your hands free. Backpack coolers are taking off. What sets the BackFlip apart from others on the market? Three main criteria set the Hopper BackFlip apart. Comfort: YETI designed the Hopper BackFlip with an ergonomic shape. It’s taller and wider, so it efficiently distributes the weight of the load, while the comfortable shoulder straps make journeys off the beaten path feel seamless. A removable chest strap and waist belt are included for added stability. Durability: The Hopper BackFlip features the brand’s extremely durable DryHide Shell, an 840-denier nylon, TPU-laminated material that is abrasion and puncture resistant. 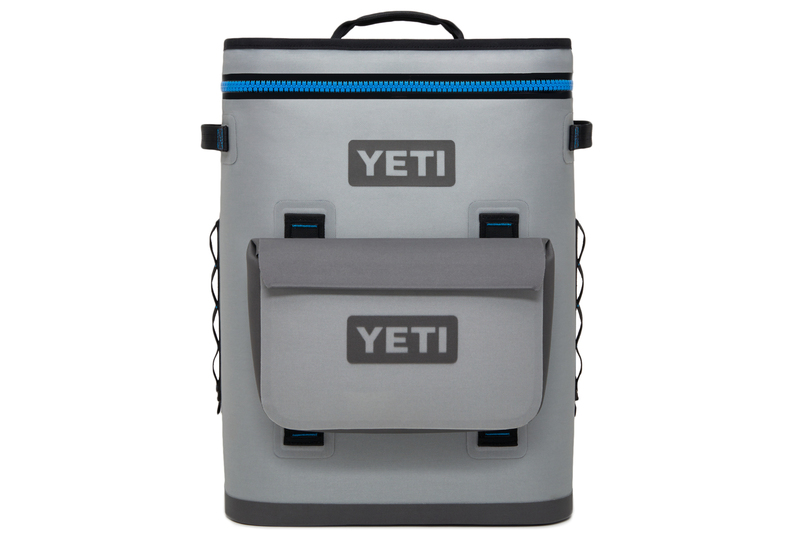 Additionally, the Hopper BackFlip boasts YETI’s famed HydroLok Zipper, which is 100 percent leakproof, ensuring the cold – or heat – stays inside. Lastly, the BackFlip’s antimicrobial liner protects from mildew. Ice retention: YETI’s ColdCell insulation offers far superior cold-holding power compared to ordinary soft coolers. The BackFlip features 0.75-inch-thick closed-cell foam on the sides, with 1-inch-thick foam on the bottom. Depending on the situation, the Hopper BackFlip will retain ice for days at a time. While we can’t give an exact number of days, we promise it’s impressive. Drinks are great, but what else can you store in the BackFlip? 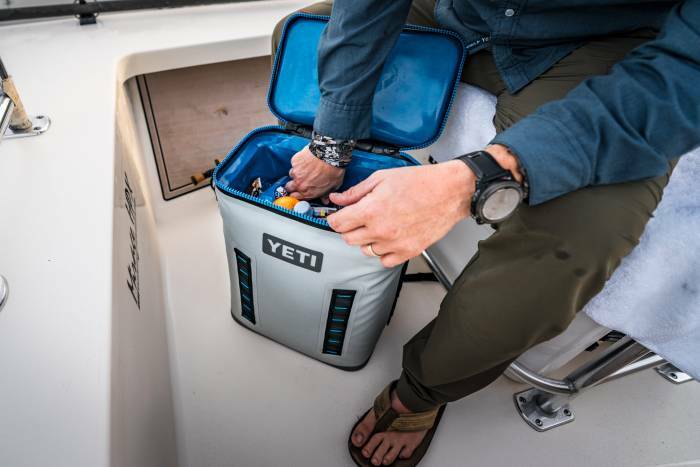 Whether it’s lunch for you and your climbing partners, or your daily catch, the extreme insulation properties of YETI’s Hopper series will store anything you want to keep cold, or even warm. Additionally, we’ve heard of folks utilizing Hoppers as dry storage, protecting valuable electronics from the elements, like cameras, computers, etc. After all, that 100 percent leakproof bomber zipper and construction means this is a totally waterproof backpack. How well does it retain heat? Simply put, the insulation properties remain the same whether you’re storing hot or cold items. Depending on the situation, the Hopper BackFlip will keep hot items hot for hours on end. We do not recommend temperatures over boiling – 212 degrees Fahrenheit (100 degrees Celsius), which may damage the cooler. For questions or tips on proper food safety and handling, we strongly recommend following consumer guidance from the FDA. What’s the best way to pack a cooler backpack? We recommend pre-chilling your cooler for the best ice retention. Line the bottom with ice, then pack contents using a 2:1 ice-to-contents ratio. Always dock the waterproof zipper to create a 100 percent airtight seal, allowing for maximum ice retention. Follow general backpacking rules, which includes packing lighter and less-needed items at the bottom, heavy items in the middle and closest to your back, and lightest and/or frequently needed items on top. What are some other features beyond its insulation? 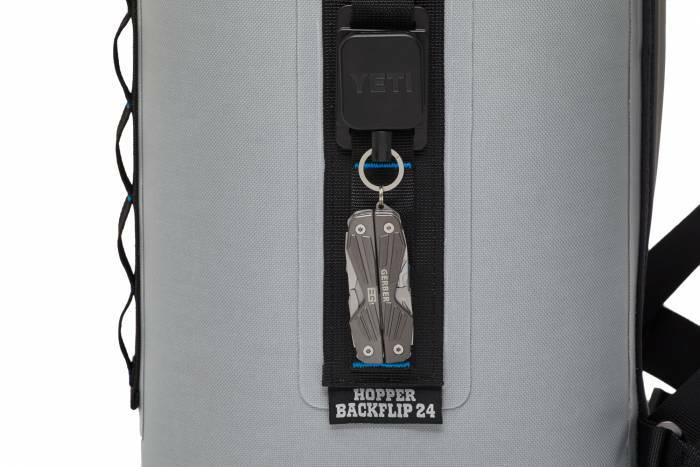 The BackFlip features YETI’s HitchPoint grid system, which allows you to fasten bottle openers, carabiners, and other accessories through the strapping. Users can outfit their Hopper with YETI’s MOLLE Bottle Opener or MOLLE Zinger retractable key/gear holder. 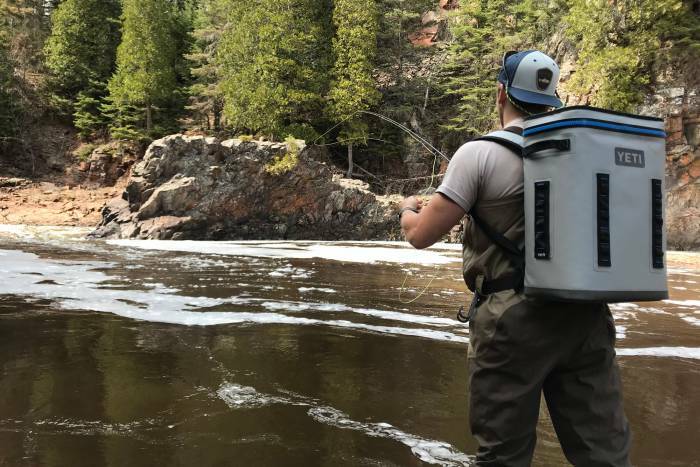 The BackFlip also accommodates the SideKick Dry gear case, which is waterproof and the perfect accessory for keeping small items such as phones, wallets, and fishing licenses easily accessible. How is the BackFlip “overbuilt”? The RF-welded construction is tougher than standard sew constructions and allows for minimal sewing (i.e., potential failure points). And all our handles are reinforced to withstand more abuse than is likely. YETI tested the top handle, for example, in both static and dynamic environments to support way more weight than you would ever carry in this backpack. And the HydroLok Zipper is the same zipper used in high-performance emergency gear such as survival suits and HazMat protective gear. What are some tips for maintaining the BackFlip? Here’s how to keep the cooler clean and the watertight zipper functioning properly. The liner is antimicrobial, mildew resistant, and FDA food-grade approved. A mixture of dish soap and water should do the trick. Rinse with fresh water and thoroughly wipe the inside dry. Caring for the HydroLok Zipper is extremely important. Each Hopper comes with a small tube of lubricant for that purpose. Make sure to apply the lubricant to the zipper after cleaning, before storage, and any time it feels stiff. And for maximum performance, make sure the zipper is always free of dirt, grime, or other debris. Leave the zipper open for several days to ensure all moisture has dried. Always store the Hopper in the fully closed position after making sure the inside is completely dry. The BackFlip uses “ColdCell” insulation. How is it different than the Tundra’s “PermaFrost” insulation? ColdCell insulation is a closed-cell foam. It’s pliable and extremely durable. The best example of this is that it will not “take a set,” which means you can compress the foam and leave it compressed over a long period of time. But it will recover its original thickness to provide maximum insulating power. PermaFrost insulation uses pressure-injected, commercial-grade polyurethane foam in the walls and lid. It’s perfect for the Tundra’s rotomold construction and adds rigidity and durability to the Tundra coolers. In general, how do hard- and soft-sided coolers differ in performance and technology? The hard-side Tundra series is ideal for maximum ice retention. Whether you’re setting up a backcountry base camp, hosting a barbecue, or transporting elk meat from Colorado to Texas, the Tundra serves as a workhorse. These coolers are perfect if you don’t need to move them around much (or at all), and especially when you have a lot of food and drinks to keep cold for a long time. As for the Hopper series, these portable coolers are ideal for shorter trips that require premium quality and durability. Whether you’re headed to the beach or down the river for a few days, the Hopper works best for trips when you require easy transport. Technically speaking, the Hopper series has YETI’s abrasion- and puncture-resistant DryHide nylon exterior, a 100 percent leakproof zipper, and an antimicrobial interior. This article is brought to you by YETI. Check out its Hopper BackFlip here as well as its other coolers and gear.